Monte Walsh in Spanish from YouTube. This movie is not easy to get. 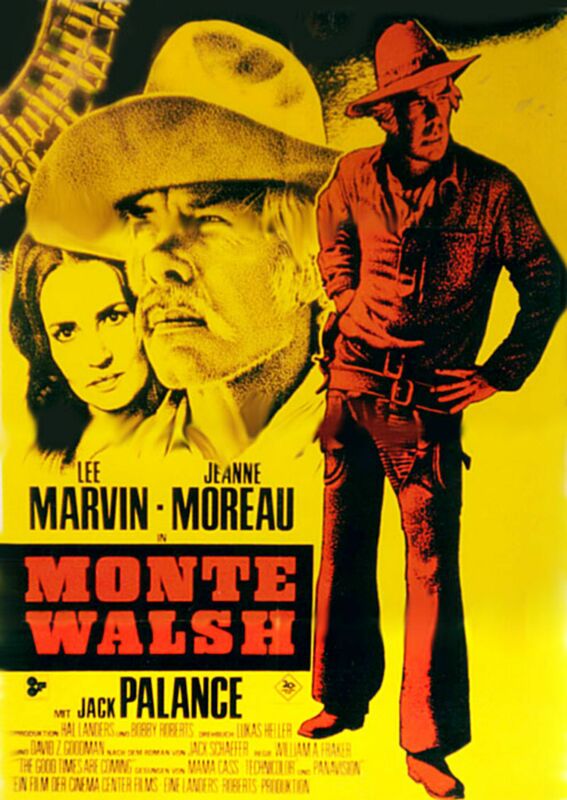 MFW: Monte Walsh seemed to get decent promotion – lots of excellent posters – and boasts a stellar cast … yet somehow seemed to slip under the fence. But I believe this is one Western that will age well and eventually earn it’s rightful place at the bar. I’m giving Monte Walsh an 8 out of 10. 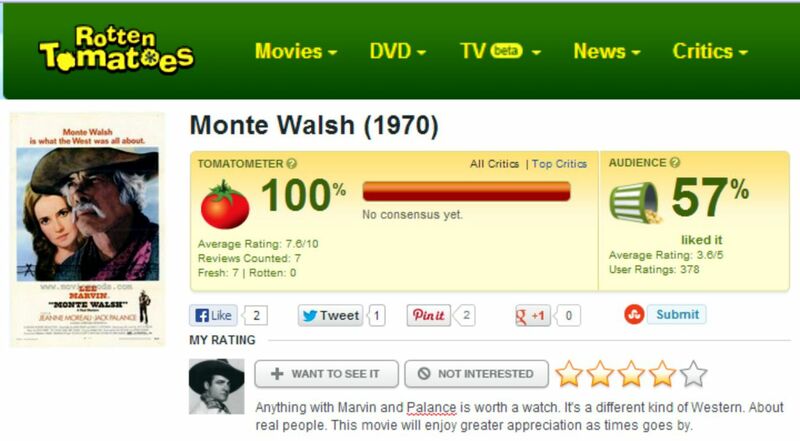 “100%” from critics and “57%” from viewers ?? That’s a pretty large canyon. I have been wanted to watch this one again for years. It has been so long since I saw it that I don’t remember any of the story. The Encore Western Channel has been showing the remake starring Tom Selleck. I have been avoiding watching that one, preferring to be re- acquainted with the original classic first. 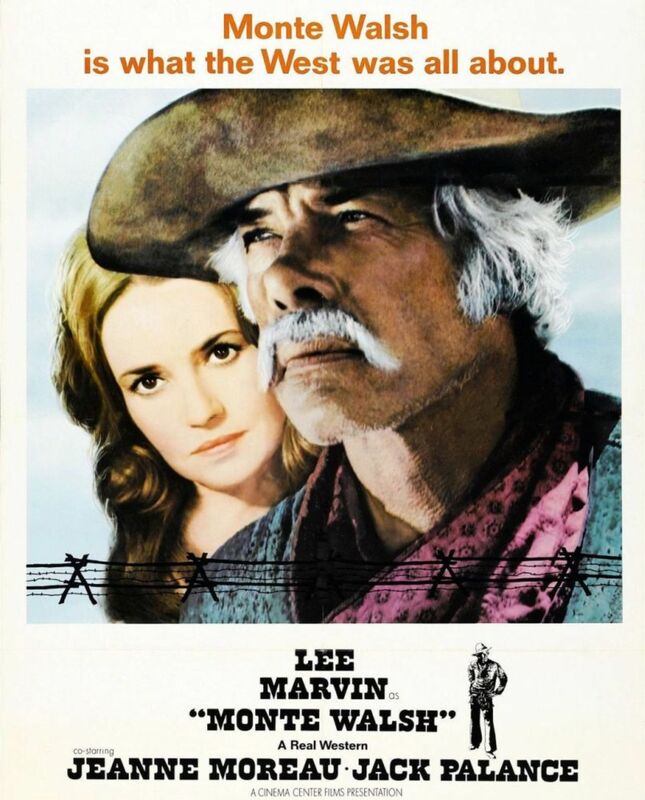 I regard the Palance/Marvin 1970 version as a minor Classic. Selleck’s is OK though. 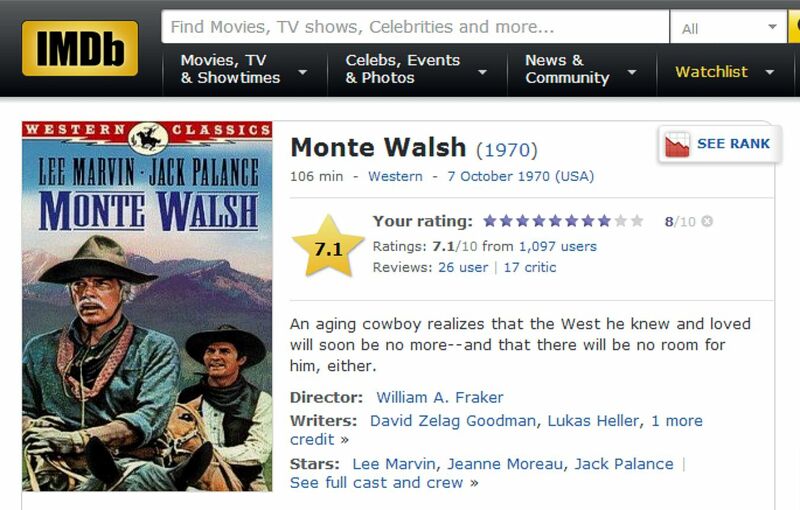 Someone has posted the 1970 version of Monte Walsh on You Tube, so naturally, I checked it out. I found it to be a damn good movie. 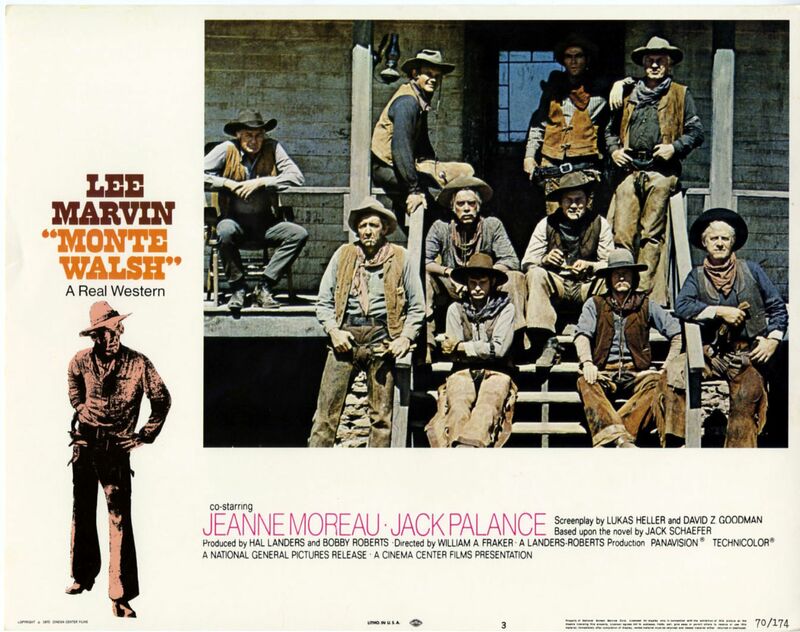 Lee Marvin and Jack Palance both give excellent character studies of 2 aging cowboys in a changing West. I found it interesting they considered the job of ‘riding fence’ to be a fate worse than death and Marvin refusing any job he couldn’t do from the back of a horse. It also contained many familiar faces in supporting roles like Matt Clark, Bo Hopkins, Jim Davis, JD Spradlin, and Michael Conrad. Having said that, I have to point out 2 problems I had with the film. First was the theme song ‘The Good Times Are Coming’. I think Cass Elliott was a talented singer with an angelic voice that served her well n the Pop/Folk Genre, but it just didn’t seem to fit this movie. The light, Pop song was kind of jarring to me when presented as the background of a gritty western. I must admit, the orchestrated version used in the melancholy latter scenes worked well. It is not a bad song, it just kind of took me by surprise. The second thing was the movie seemed slow at the beginning, maybe that was on purpose to show the daily grind of cowboy work, but as the story developed, it picked up the pace nicely. Neither of these 2 issues was big enough to ruin the movie, or my enjoyment of it. I am sure I will watch it again sometime. I am now curious to see what the 2003 TV-Movie remake with Selleck is like. Nice comments my friend. Glad you liked that movie. Yeah the song surprised me too. But the lyrics seem to fit the melancholy theme about the end of an era. Selleck? Didn’t really think much of this remake. I want to watch it again though. Tom’s talents have not been well used at times. Marvins and Palance? No problem watching it again. But it is hard to come by if you are seeking a Torrent – but can buy via Amazon. Thanks for dropping by – always glad to hear from you. An underrated film in my opinion, I always enjoy catching and get drawn in emotionally to Marvin and Palance’s characters. I think Palance has got the maturer role out of the two. He wants to settle down and have a quiet life after years of being on the move. Whilst Marvin is more or less Marvin to an extent, not say that’s a bad thing. A pleasure to watch, would you recommend the Tom Sellick remake? You’re right, this is a very fine Western. Palance and Marvin are both great – as usual. Good story. Well told. I’ve watched a few times. Will again. If the Marvin/Palance version didn’t exist Sellick’s would stand nicely. 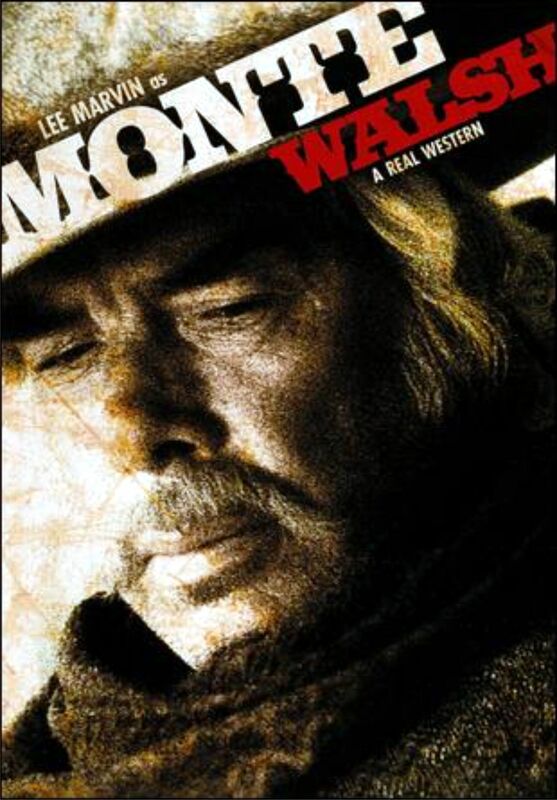 And though Sellick is a great Western Actor also, I find it a bit weak compared to the other. That’s just my opinion though. That’s interesting, I remember recording it, (thinking it was the original) it felt like a TV movie, a bit soft and shiny to get into. I think it deserves another look if not to just check it out.